Bob Nelson has been entertaining audiences with his comedic abilities since 1978. He's performed for thousands of people at places like Radio City Music Hall, Carnegie Hall and on Broadway. No stranger to television, Bob has been a guest on The David Letterman Show and The Tonight Show. In addition, he has been seen on the silver screen in Kindergarten Cop and This Is My Life. 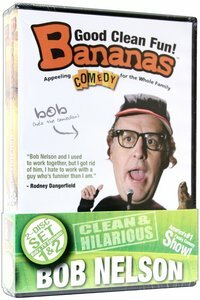 About "Bananas Bob Nelson 1 & 2"
Bob Nelson, Ph.D., is president of Nelson Motivation, Inc., a founding board member of the National Association for Employee Recognition (NAER), and bestselling author, including the 1001 Ways series and Managing for Dummies. Dr. Nelson lives and works in San Diego, California.